I grew up at a time when South Africa’s apartheid system guaranteed its isolation from the rest of the world. As a teenager, I watched the news relaying township riots, the violence, sickening racism and injustice, and the seemingly endless incarceration of Nelson Mandela. Like most, I saw a country through the prism of shocking headlines. As a consequence, it is easy for an outsider to perceive South Africa as a country that only “began” after Mandela’s walk to freedom. This stunted view extends to wine. I once naively assumed that apart from the sweet wines of Constantia, the modern South Africa wine industry began in the mid-1990s. In a way it did. But the truth is that whilst the end of apartheid did create the foundations for what became today’s successful wine industry, the prosaic truth is that during the years of apartheid, people still fancied a glass of wine. During the days of segregation the wine industry ran more or less like a government-controlled monopoly through KWV. Practically all farmers signed long-term contracts and KWV would fix prices and production through a quota system, which inevitably meant there was little incentive to improve viticulture or wine quality, not least since KWV had no domestic competition. (I recommend reading either Tim James of Michael Fridjhorn for further insight.) However, there were winemakers operating within this strict system who aspired to make quality wines. A handful of extant bottles from the 1950s, 1960s and 1970s prove that against the odds, South Africa could occasionally produce extremely fine wines with surprising longevity. A number were released under the Lanzerac label. The trademark was purchased by the Stellenbosch Farmer’s Winery in 1958 and the name became famous not only for the teardrop shaped bottle, but for releasing the first Pinotage. You might scoff at the mention of that Cinsault and Pinot Noir crossing but before you do, take my word that a 1961 Lanzerac Pinotage tasted blind is as good if not better than a number of Bordeaux born that same vintage! Yours truly was completely fooled in a blind tasting. During my recent visit to the Cape, I planned a lunch with Merchant Roland Peens. To my surprise, he munificently poured four bottles of Lanzerac Cabernet from the 1960s that he had recently acquired from a private cellar. Bottles from this era are now increasingly difficult to find. Most were drunk in their youth and any that were kept were not necessarily stored in cool damp cellars. One thing to keep in mind is that the wine itself may only bear semblance to what is mentioned on the label. These Cabernets probably contained a large proportion of widely grown Cinsault and whatever else the blender saw fit. No spanking new François Frères either – the wines would all have been matured in old 5,000-litre Slovenian foudres. These venerable South African bottles are often a bit like Russian roulette, and the pleasure is derived from chancing upon great bottles rather than great wines. Then again is Burgundy from this era much different? The first three, the 1961, 1962 and 1963 were interesting rather than profound examples of their type. The 1961 Lanzerac Pinotage, the second release after the debut 1959, has a surprisingly vivacious bouquet with hints of star anise that suffuse its ample, quite glossy red-berry fruit, like before, displaying an almost pastille-like purity, just a touch of eau-de-vie developing with aeration. The palate is smooth in texture, velvety even, adorned with well-judged acidity and a disarming succulence that you never expect in such a venerable Pinotage. Of course, there will inevitably be some degree of variation, but this bottle does attest the ability of this grape variety to age. 92/Drink 2018-2023. The 1961 Lanzerac Cabernet has a rustic nose, quite animally and feral, decaying with extended aeration. The palate is actually very harmonious, with a taut line of acidity and much finer tannins than expected. There is a distinct balsamic note to this Lanzerac and it displays an Italian-like finish, almost like an old Chianti! Whilst there is a lot of VA to contend with, the 1961 is still a fascinating and enjoyable treat. 88/Drink 2018-2020. The 1962 Lanzerac Cabernet is a little diffuse on the nose: quite nutty compared to the 1961, and with a mulch-like, almost compost-like scent. The palate is medium-bodied with a menthol-tinged entry, a fine bead of acidity, quite medicinal with clove, peppermint and white pepper; a dab of juniper on the frayed but decent finish. It does not quite boast the harmony of the 1961 but well-kept bottles should continue to drink well. 88/Drink 2018-2022. The 1963 Lanzerac Cabernet, a vintage that I have encountered previously, has a meaty, burly bouquet, rustic and Rhône-like in style. The palate is medium-bodied with light tannin, simpler than some of the other old Lanzerac bottles I have tasted with just a little dryness to the Bandol-like finish, implying there might be a higher proportion of Mourvèdre. 85/Drink 2018-2018. 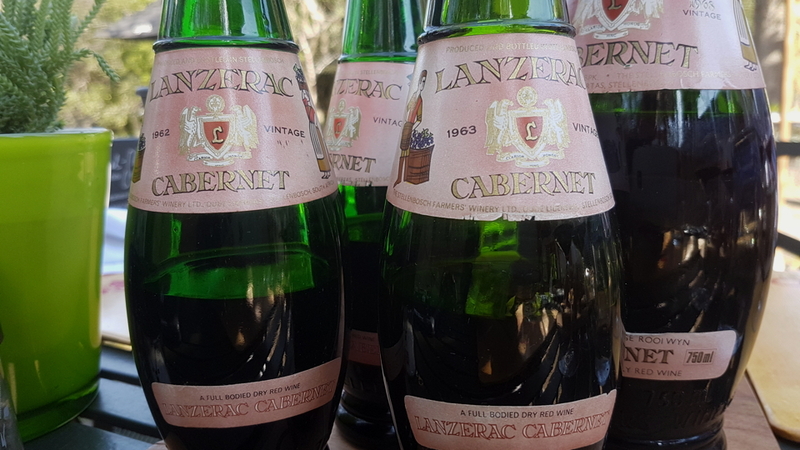 The 1968 Lanzerac Cabernet has the most Cabernet-influenced bouquet of the old Lanzerac bottles I have encountered: mint-tinged black fruit, marmalade, orange blossom and juniper are all vivid and well defined. The palate is medium-bodied, with a gentle grip, and supple in the mouth with touches of peppermint towards a very harmonious and tender finish. There is vitality and nuance here, not just a survivor but a really splendid wine that at half-a-century, continues to give so much drinking pleasure. 93/Drink 2018-2030.